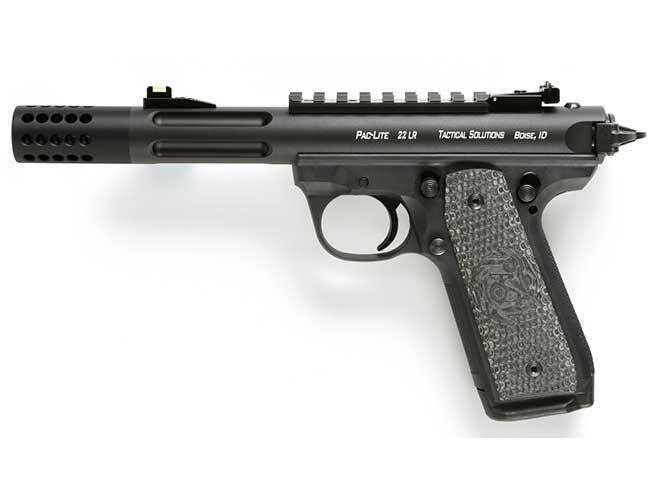 Tactical Solutions offers a Pac-Lite pistol that is based on the Ruger 22/45, a polymer-framed pistol that features a 1911-style grip & operating controls. 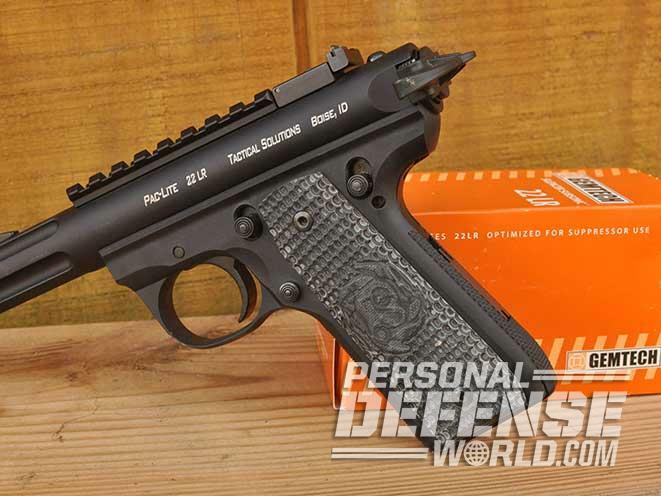 After years of offering Pac-Lite uppers for Ruger rimfires, Tactical Solutions is now offering complete pistols for discerning shooters. 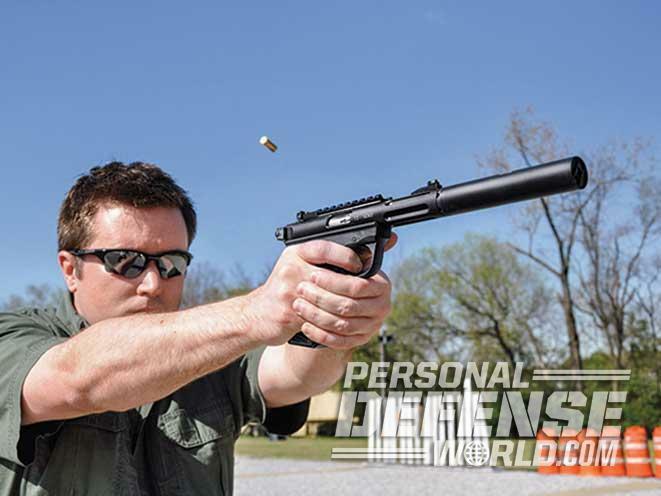 The Pac-Lite comes ready for sound suppressor use. Just unscrew the muzzle brake to expose the 4.5-inch barrel’s 1/2×28-tpi threading. Aside from a threaded barrel and muzzle brake, the Pac-Lite comes with a green fiber-optic front sight. The Pac-Lite also features controls that mimic those of a 1911-style pistol. An adjustable rear sight and a Ruger racker allow for quick bolt manipulations. The Pac-Lite comes with G10 grip panels that offer plenty of control, and thanks to the frame design, any 1911-style grips can be added with ease. 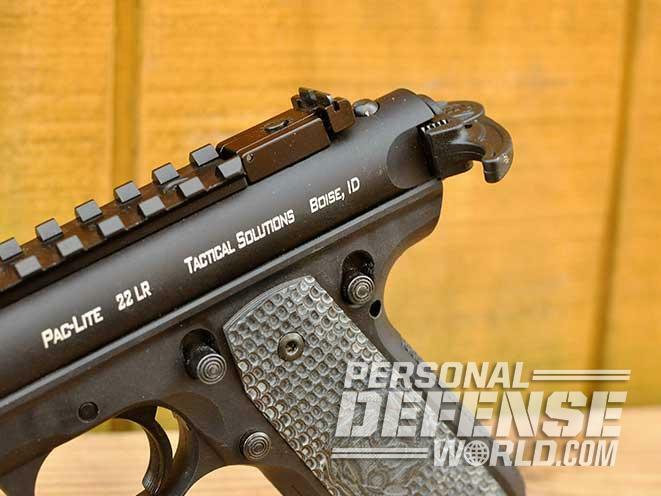 Tactical Solutions lists the Pac-Lite’s weight as being 21 ounces, and it’s even lighter with the 10-round magazine removed. 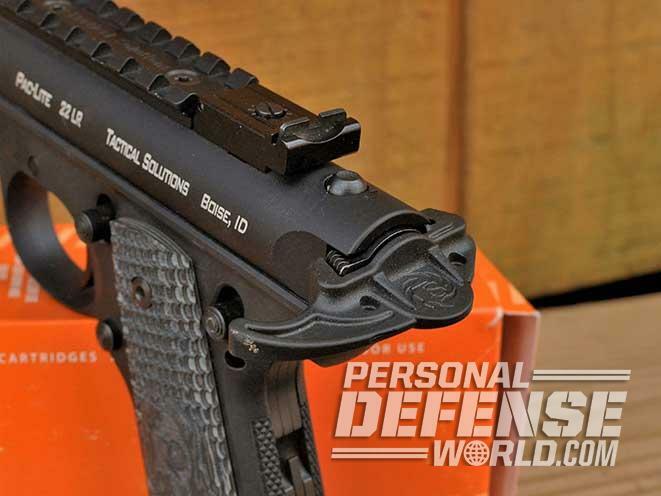 Tactical Solutions currently offers Pac-Lite rimfire pistols with matte black or OD green barrel assemblies that are either smooth or fluted for addtional weight savings. Boise, Idaho, is one of those cities that, when you visit, makes you wish that you could live there. Located in the “lowlands” of the southwestern portion of the state, Boise has a moderate climate while still being within close driving distance to the mountains. Surrounded by thousands of acres of BLM land, prime hunting, fishing and winter recreation is but a short drive away. The scenery is spectacular, and the people are every bit as warm and friendly as those in my home state of Georgia. Boise is also home to a number of well-known firearms companies. One of those is Tactical Solutions. 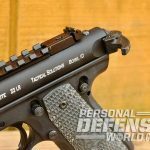 Chet Alvord and his partners started Tactical Solutions in 2002 with a single product, an aftermarket upper receiver for Ruger’s popular .22 LR pistols. Today, the company employs 37 people with an extensive rimfire product line that includes excellent X-Ring rifles, barrel upgrades for Ruger’s 10/22 and 77/22 rifles, and .22 LR conversion units for both Glock and 1911-style pistols. In addition, Tactical Solutions also offers complete AR-22 rifles, conversion kits and a line of .22 LR sound suppressors. The Pac-Lite was Tactical Solution’s first product, and it continues to be the flagship of the company. 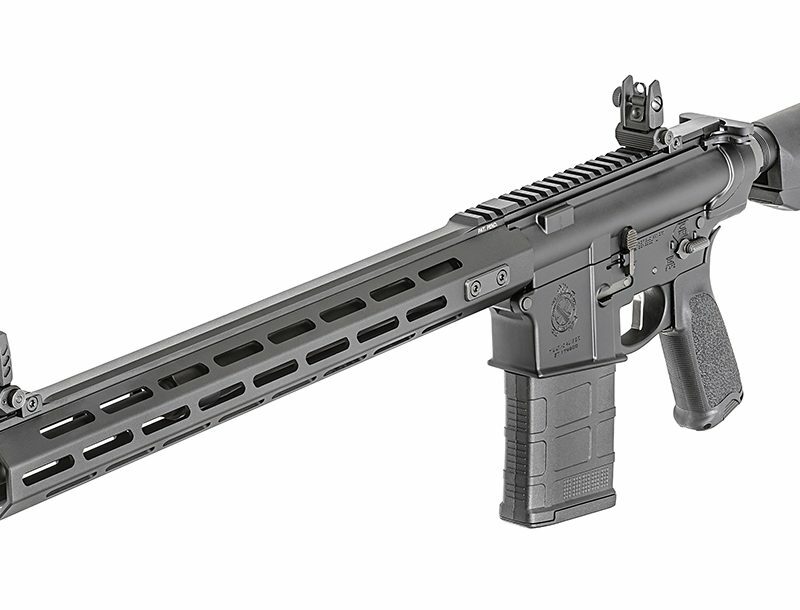 The Pac-Lite is a complete replacement upper for a Ruger Mark series or 22/45 pistol. 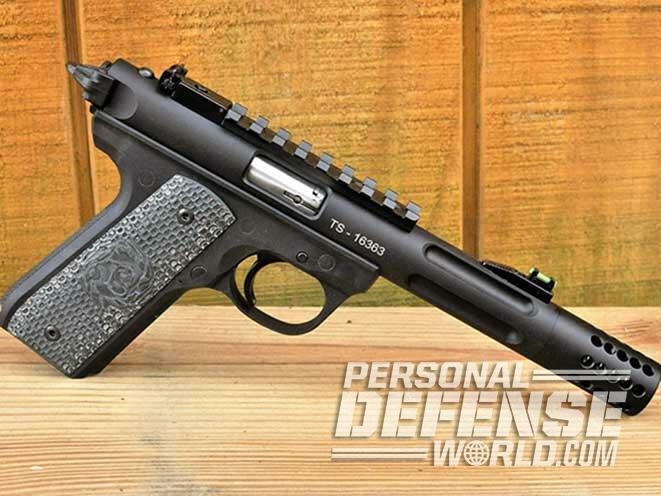 When first introduced, the Ruger Standard was an all-steel pistol with basic fixed sights and a tapered barrel. 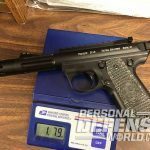 While a great trail and plinking pistol, it was somewhat limited. The Pac-Lite upper was crafted from a solid billet of aircraft-grade aluminum to reduce weight and im-prove balance. The match-grade barrel and adjustable sights offered a significant upgrade in performance and became wildly popular with both sportsmen and competitors alike. 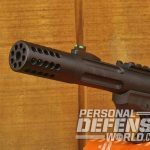 Since its humble start, the Pac-Lite product line has matured to include a wide variety of options, including plain or fluted barrels either 4.5 or 6 inches long that come in a variety of colors. Recognizing the trends in accessories and optics, the Pac-Lite can also accommodate a scope base for an optic and an accessory rail mounted under the barrel for lights, lasers, etc. 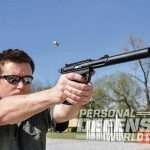 Almost from the start, the company recognized the potential of the rimfire suppressor market and offered a threaded-barrel Pac-Lite long before the major players. During my annual pilgrimage to the SHOT Show in Las Vegas, Tactical Solutions is always on my list to visit. Chet Alvord is a wonderful host who offers the two most important gifts to a gun writer: a bottle of water and a place to sit. We have often discussed the state of the firearms industry, what is hot and not so hot, and what is next for Tactical Solutions. 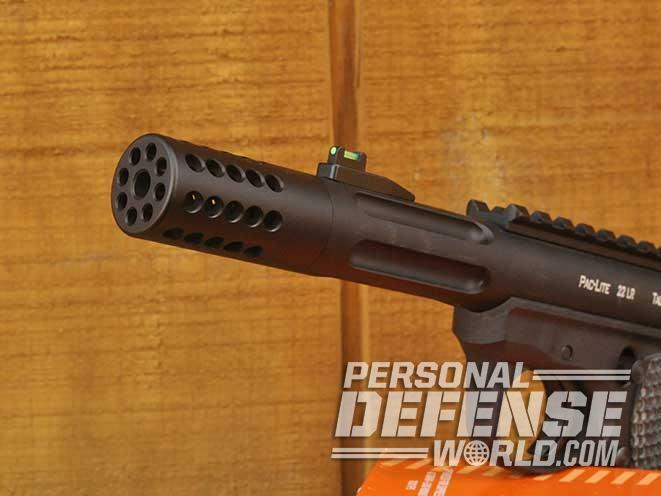 While the Pac-Lite has been more successful than ever imagined, it requires a shooter to buy a stock Ruger pistol and then disregard the upper receiver. 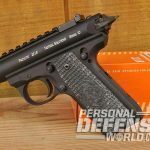 For those not familiar with Ruger’s Mark series and 22/45 pistols, the upper is the serial-numbered part that is considered the firearm, not the lower, as with most pistols. For the past five or more years, I have encouraged and harangued Alvord to offer his own complete pistol. For years, he has said it is “in the works.” Well, it is finally here! 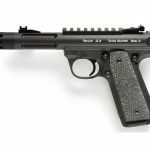 Tactical Solutions is now offering a complete Pac-Lite pistol that is based on the Ruger 22/45, a polymer-framed pistol that features operating controls and a grip similar to the venerable 1911. The Pac-Lite comes standard with a green fiber-optic front sight, a fully adjustable rear sight and a scope base. 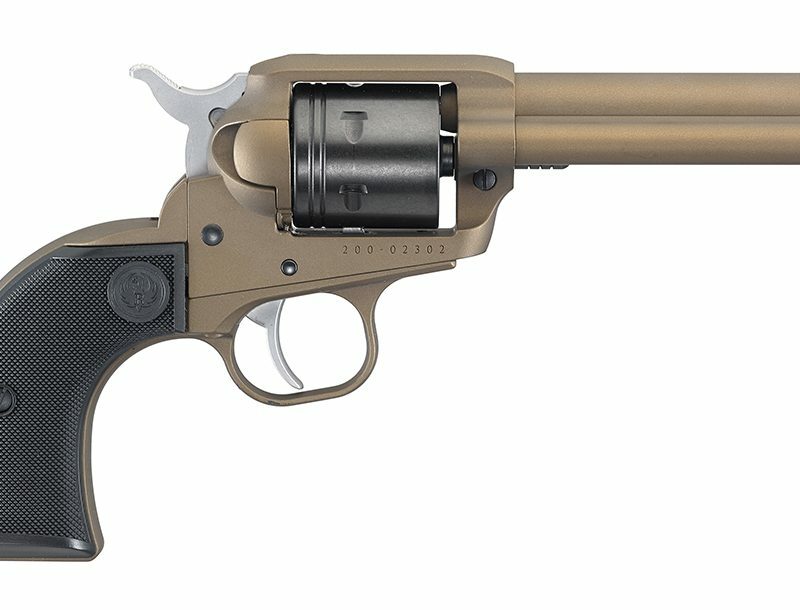 The threaded, 4.5-inch barrel is capped off with a Pac-Lite Compensator that features 360-degree ports to reduce muzzle rise. It also gives the pistol an all-business appearance. A scope base is mounted in front of the rear sight and is ideal for either a magnified optic or a red dot such as Aimpoint’s excellent Micro H-2. One new feature is the Ruger Racker, which is a polymer grip handle that clamps to the rear of the bolt. The Ruger Racker can be mounted for either left- or right- handed shooters and provides a positive purchase on the recessed bolt. 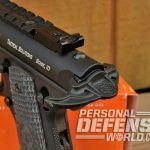 While the outside of the Pac-Lite is impressive, the folks at Tactical Solutions have spent a considerable amount of time inside the pistol. A match-grade sear has been installed and fitted while specific internal parts have been polished. 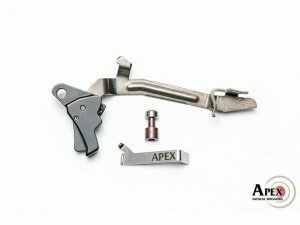 In addition, a trigger job ensures that the shooter can maximize his or her performance. 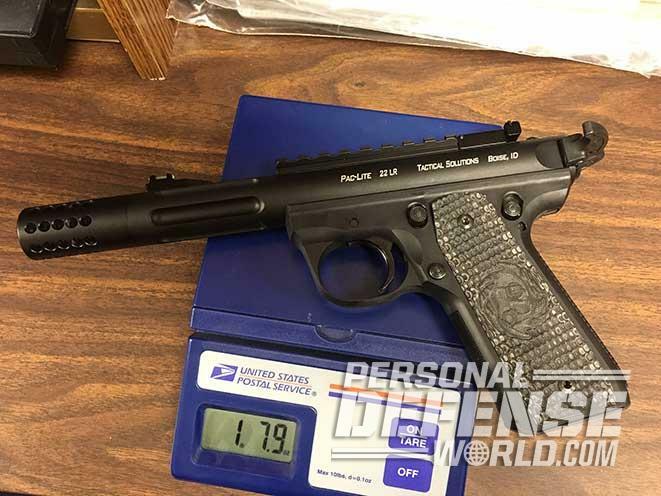 A complete quality-control check ensures that the customer is getting a finely tuned pistol that is capable of match-grade performance while providing 100-percent reliability. Like what you’re reading? 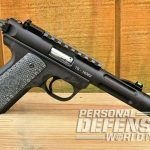 Check out the rest of this article in ‘Handguns Buyer’s Guide’ 2017. For information on how to subscribe, please email subscriptions@outdoorgroupmags.com or call 1-800-284-5668.